Organic caramel vanilla ice cream is so creamy and has such depth of flavor, it’s hard to believe it only contains four ingredients. It’s true, though! 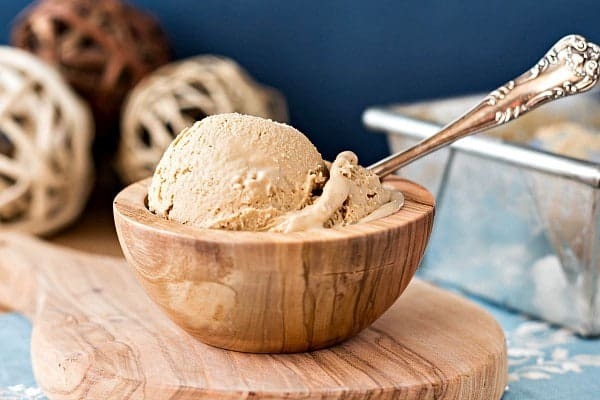 Friends, I am generally excited about food, but I have to tell you, you really must drop whatever you’re doing right now and make this ice cream. That is how excited I am about this particular food. 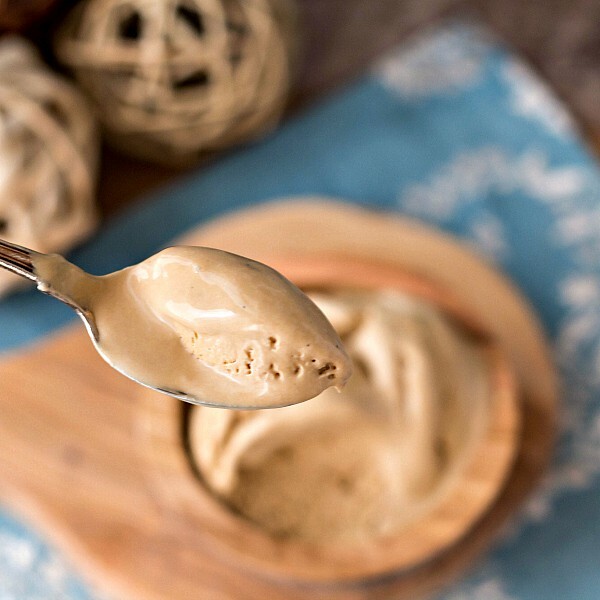 I even made you a pin, because I think you’ll want to hold onto this organic ice cream recipe! I will admit there is a bit of a process since you have to make homemade organic sweetened condensed milk first. It’s made with palm sugar. 2 Aren’t these bowls great? Here’s where you can get them. Let me amend my direction: drop whatever you’re doing right now and make the sweetened condensed milk with no refined sugar first. Then make this ice cream. Aren’t these bowls great? Here’s where you can get them. It’s made with all organic ingredients. It contains no refined sugar. It’s no-churn, so you know it’s easy to make. 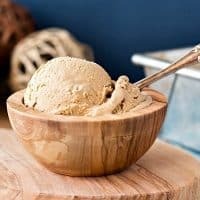 It’s incredibly creamy and smooth with a deep, caramelized flavor and no bitterness. It melts into dreamy pools of thick, naturally sweetened cream. It makes me smile when I eat it. You’ll be able to pronounce all the ingredients. You will be in caramel vanilla heaven. 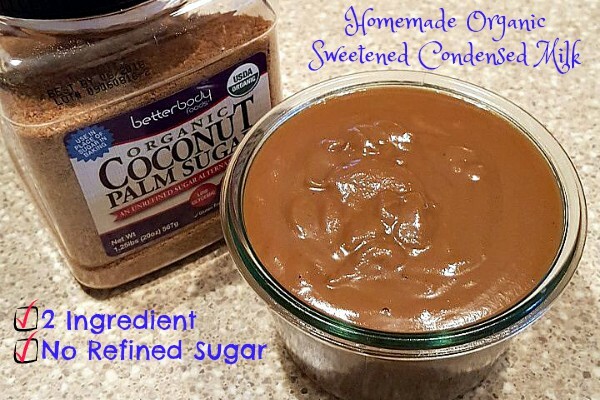 Even though it tastes super caramelly, you don’t have to caramelize sugar to make it. You can add in mix-ins like ganache or grated chocolate or toffee bits or whatever sounds good to you. Like all the no-churn ice creams I’ve made, this doesn’t get icy, even if it melts and refreezes. It will make you smile when you eat it. Let’s just stop talking about it and make some, okay? 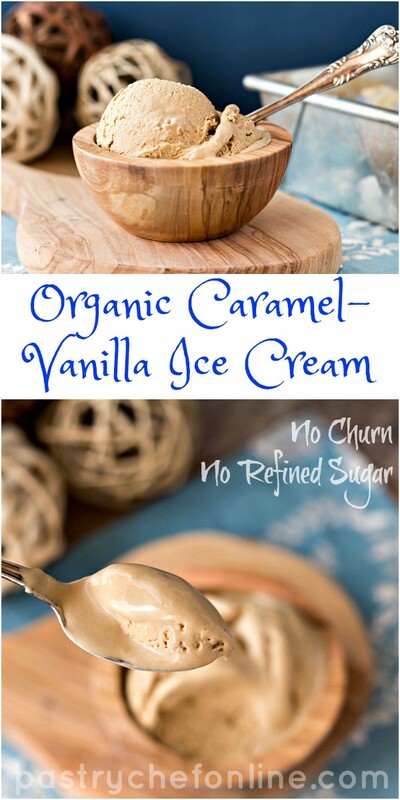 Organic Caramel Vanilla Ice Cream is No Churn and contains no refined sugar. You can feel good making it for your family. But you don't have to share if you don't want to. In the bowl of your stand mixer fitted with the whisk attachment, combine the sweetened condensed milk, cream, vanilla and salt. Whisk on medium speed for 2 minutes. Whisk on high speed until whisk leaves tracks in the cream and it just barely mounds in a spoon, about 1 1/2 minutes. You are looking for about cake batter consistency. 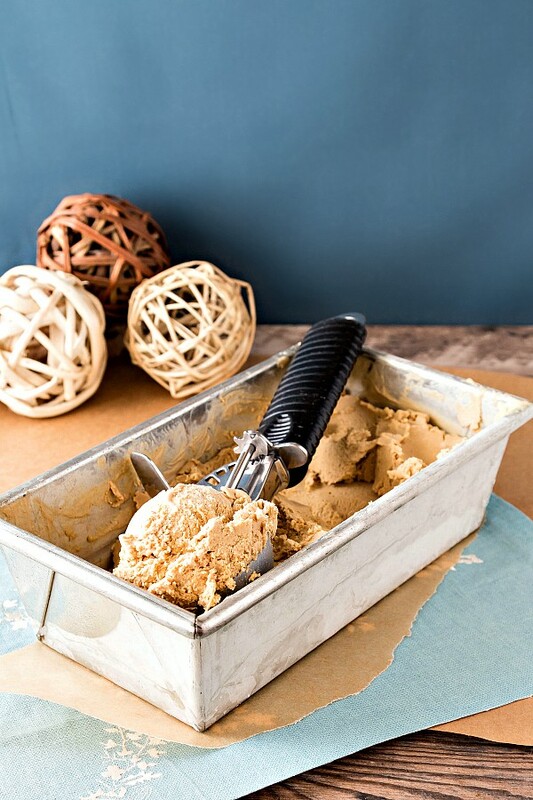 Pour/scrape your ice cream base into a freezer safe container. Press plastic wrap onto the surface of the ice cream and freeze until firm, 4-6 hours and preferably overnight. I am completely serious when I say you really need to make this ice cream. 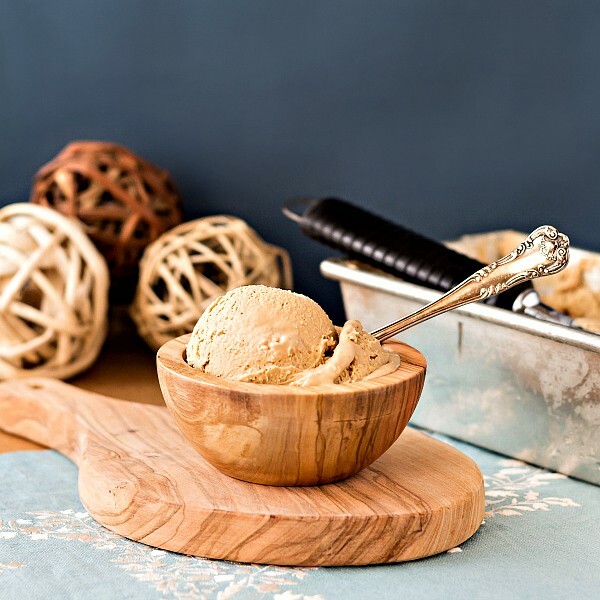 Especially you caramel lovers out there: caramel ice cream doesn’t get much better than this. 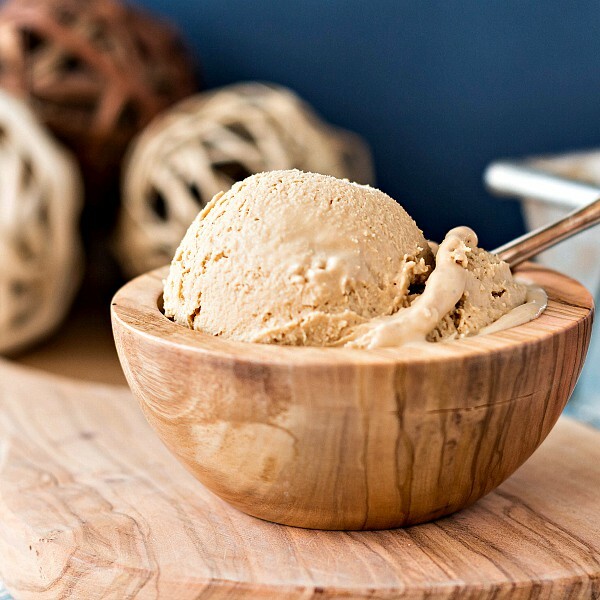 You can even double the salt to make fancy salted caramel ice cream. Each time I make a no-churn ice cream, I think it can’t get any better. And then I go and make one that’s organic and contains no refined sugar, and it might be my favorite so far. I know you will love it. Thanks for spending some time with me today. Enjoy the ice cream, and have a lovely day. Thanks Jenni, this is setting up in the freezer now. I used Becky’s SCM recipe enlarged to yield 15 oz and the whipping cream. I didn’t have the time to make my own SCM from scratch. The ice cream mixture is so yummy just as it is. I’ll be serving it with a peach galette for dessert tonight. I’ll be using Brook’s recipe for the galette by adding peaches to his blueberry galette recipe. Can’t wait to hear all the oohs and aahs over both recipes! Oh nice! 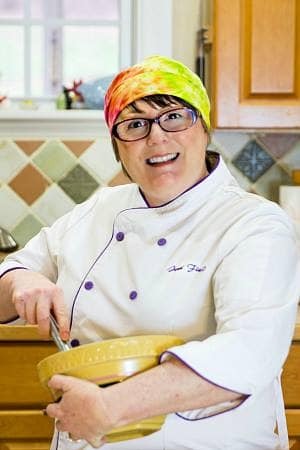 I heartily support this entire dessert, Jo-Anne! Please post a pic over on the page–would love to see! !